Not to be confused with the Democratic Republic of the Congo, also at one time known as the "Republic of the Congo". 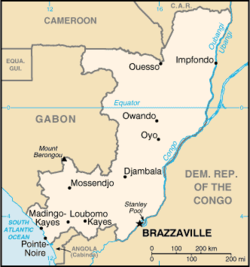 The Republic of the Congo, also known as Congo- Brazzaville (locally, "Congo-Brazza") and Congo, is a former French colony of western- central Africa. Its borders are Gabon, Cameroon, Central African Republic, Democratic Republic of the Congo, Angola and the Gulf of Guinea. Upon independence in 1960, the former French region of Middle Congo became the Republic of the Congo. A quarter century of Marxism was abandoned in 1990 and a democratically elected government installed in 1992. A brief civil war in 1997 restored former Marxist President Denis Sassou-Nguesso. The earliest inhabitants of the area were Pygmy peoples. They were largely replaced and absorbed by Bantu tribes during Bantu migrations. The Bakongo are comprised of Bantu groups that also occupied parts of present-day Angola, Gabon, and Democratic Republic of the Congo, forming the basis for ethnic affinities and rivalries among those states. Several Bantu kingdoms—notably those of the Kongo, the Loango, and the Teke—built trade links leading into the Congo River basin. The first European contacts came in the late 15th century, and commercial relationships were quickly established with the kingdoms—trading for slaves captured in the interior. The coastal area was a major source for the transatlantic slave trade, and when that commerce ended in the early 19th century, the power of the Bantu kingdoms eroded. The area came under French sovereignty in the 1880s (declared colony with the name of French Congo in 1891) as part of AEF, the French Equatorial Africa (modern-day Gabon, Chad, Central African Republic, and Republic of Congo). Economic development during the first fifty years of colonial rule in Congo centered on natural resource extraction by private companies. In 1924–34, the Congo-Ocean Railway (CFCO) was built at a considerable human and financial cost, opening the way for growth of the ocean port of Pointe-Noire and towns along its route. During World War II, Brazzaville became the symbolic capital of Free France during 1940–43. The Brazzaville Conference of 1944 heralded a period of major reform in French colonial policy, including the abolition of forced labour, granting of French citizenship to colonial subjects, decentralization of certain powers, and election of local advisory assemblies. Congo benefited from the postwar expansion of colonial administrative and infrastructural spending as a result of its central geographic location within AEF and the federal capital at Brazzaville. Following independence as the Congo Republic on August 15, 1960, Fulbert Youlou ruled as the country's first president until labour elements and rival political parties instigated a three-day uprising that ousted him. The Congolese military took charge of the country briefly and installed a civilian provisional government headed by Alphonse Massamba-Débat. Under the 1963 constitution, Massamba-Débat was elected President for a five-year term but it was ended abruptly with an August 1968 coup d'état. Capt. Marien Ngouabi, who had participated in the coup, assumed the presidency on December 31, 1968. One year later, President Ngouabi proclaimed Congo to be Africa's first "people's republic" and announced the decision of the National Revolutionary Movement to change its name to the Congolese Labour Party (PCT). On March 16, 1977, President Ngouabi was assassinated. An 11-member Military Committee of the Party (CMP) was named to head an interim government with Col. (later Gen.) Joachim Yhombi-Opango to serve as President of the Republic. After decades of turbulent politics bolstered by Marxist-Leninist rhetoric, and with the collapse of the Soviet Union, Congo completed a transition to multi-party democracy with elections in August 1992. Denis Sassou-Nguesso conceded defeat and Congo's new president, Prof. Pascal Lissouba, was inaugurated on August 31, 1992. However, Congo's democratic progress was derailed in 1997. As presidential elections scheduled for July 1997 approached, tensions between the Lissouba and Sassou camps mounted. On June 5, President Lissouba's government forces surrounded Sassou's compound in Brazzaville and Sassou ordered his militia to resist. Thus began a four-month conflict that destroyed or damaged much of Brazzaville. In early October, Angolan troops invaded Congo on the side of Sassou and, in mid-October, the Lissouba government fell. Soon thereafter, Sassou declared himself President. The Congo Civil War continued for another year and a half until a peace deal was struck between the various factions in December 1999. Elections in 2002 saw Sassou win with almost 90% of the vote. His two main rivals Lissouba and Bernard Kolelas were prevented from competing and the only remaining credible rival, Andre Milongo, advised his supporters to boycott the elections and then withdrew from the race. A new constitution was agreed upon in January 2002 which granted the president new powers and also extended his term to seven years as well as introducing a new bicameral assembly. 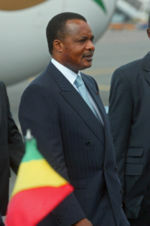 Denis Sassou-Nguesso, President of the Republic of Congo. The regions are subdivided into forty-six districts. 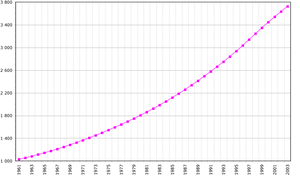 Demographics of the Republic of the Congo ( FAO, 2005; number of inhabitants given in thousands. 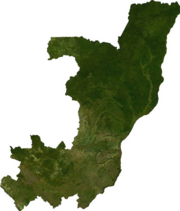 The Republic of the Congo's sparse population is concentrated in the southwestern portion of the country, leaving the vast areas of tropical jungle in the north virtually uninhabited. Thus, Congo is one of the most urbanized countries in Africa, with 85% of its total population living in a few urban areas, namely in Brazzaville, Pointe-Noire, or one of the small cities or villages lining the 332-mile railway which connects the two cities. In rural areas, industrial and commercial activity has declined rapidly in recent years, leaving rural economies dependent on the government for support and subsistence. Before the 1997 war, about 15,000 Europeans and other non-Africans lived in Congo, most of whom were French. Presently, only about 9,500 remain.